Use pre-cooked previously frozen shrimp for easy preparation. Cocktail shrimp also works well. Slice shrimp in half lengthwise to speed up dehydration. Drying is complete when the shrimp is no longer pliable, it should be crunchy and easily broken. Don't expect rehydrated shrimp to maintain a decent texture. It will taste like shrimp, but will have the texture of overcooked shrimp; it will even curl excessively like overcooked shrimp. 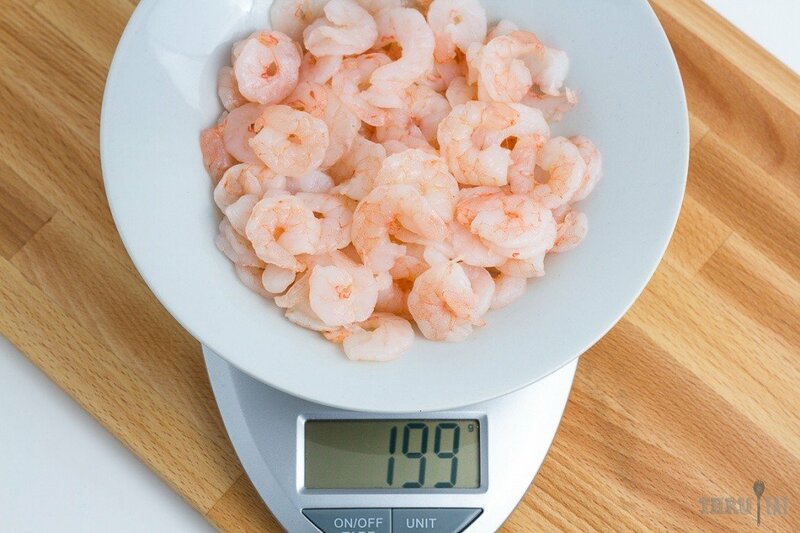 Use smaller shrimp because they'll be cheaper, dry faster, and rehydrate better. Remove all shell and tails, making sure to devein thoroughly.